Kari Järvinen got his first dog at the age of eight in 1957. Kari has had dogs of many breeds. He started breeding with a beagle and with his late wife Raija they bred Scottish and West Highlandterriers with great success. His own breed is however Boxer. He got the enthusiasm for boxers when he was handling Gitta Ringwalls boxer in shows. Most memorable and most famous of his boxers was Wedge Hollow’s Sam’s Son, in early seventies. To get Sam from the breeder he had to sell his little car. After selling Sam to Sweden Kari could afford to buy a bigger car. When judging in England in the seventies he saw Agility competitions and introduced it here. And in the mid-eighties, with the sponsorship of his employer, he was able to arrange the first training course for judges and invited a coach from England. Now agility gathers most entries and Finnish Agility competitors have been very successful in international games. Kari started also Junior Handling activities in Finland. This was in 1973. 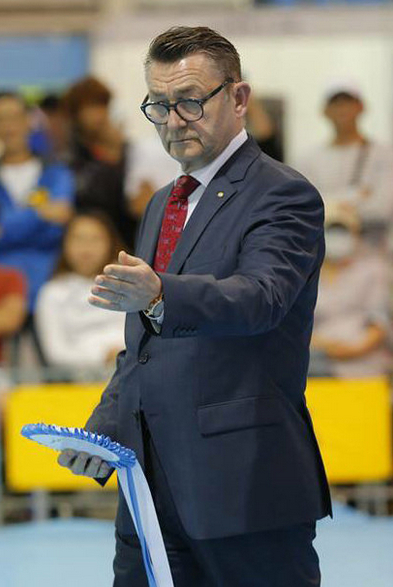 Kari started his own judging career in 1972, became all-rounder in 1991 as a first Finnish judge. In Finland it takes a long time to get rights to judge all breeds. You study and pass exams breed by breed and advance to groups. Kari has judged in 84 countries all over the world. And he has enjoyed it enormously. When travelling he was always kept his eyes open for new concepts and looked for good dogs for himself or breeder friends. Kari loves to judge dogs and doing so in different countries he has adopted ideas how to arrange good dog shows, better than those before. It has always been a challenge to catch up with the quality of Stockholm, where annual winner shows are the utmost top class. All this gathered information has been useful when Kari with his brilliant teams has been organizing Finnish Kennel Clubs’ Helsinki International Dog Show over 30 years as a Chairman of the Show committee. Kari has said that the highlight and the most magnificent moment in his judges life was 1998 in the Helsinki FCI World Dog show. Kari was BIS judge and found the most gorgeous and beautiful Papillion for the winner of that memorable show. Kari revived FCI’s Judges and show committee in the early nineties. And he was elected into the board of directors of FCI in 1995. He has represented Finland on the board of Nordic Kennel Union longer than anybody else from Finland. And he gave considerable help to assist the Estonian Kennel Club to make a new start in 1990ies. Also he help many other kennel clubs. He has been a Member of The Kennel Club since 1999. He has honorary golden decorations from the FCI, Finland and many other countries. In the Finnish Kennel Club, Kari has been serving on the Board of Directors in several periods since 1970ies, longer than anyone else and out of these 10 years as a vice president and three years as a Chairman of the Council. He has been honorary member of the Finnish Kennel Club since 2010. In 2007 Kari negotiated with the Russian Kennel Club an unique agreement, where Russian red Laikas (Karelian-Finnish Laika) and Finnish national breed Finnish Spitz were united into one breed and recognized as Finnish Spitz. This is the first time in history that dogs which lived on opposite sides of a man-made border, but which had common origins, have been acknowledged as one and the same breed. Kari’s dog career stretches back over 50 years. During this period in Finland the number of registered dogs have quadrupled and we have 10 times more members. This means that three Finns out of hundred are members of Finnish Kennel Club. During Pawscars dinner before Crufts 2018, Kari received Pawscars award in Best All Breed Judge Of The Year in UK in 2017.